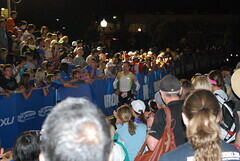 Ironman Arizona 2016 – ONE MORE SLEEP! One more sleep. Hopefully it will be a good one. We drove out to Arizona on Thursday and so far I am sleeping well! One good dream, I went 10:51 and got 5th in my age group. One bad dream, I went to New Zealand for work and wasn’t going to be able to get back to Arizona in time for the race! People keep asking how I feel and honestly I feel great! I did jam my wrist over a week ago, and it is still a bit sore, but I have decided it will NOT impact my race. Did you hear that wrist? But I keep reminding myself I did all the work; now I get to enjoy all the benefits! 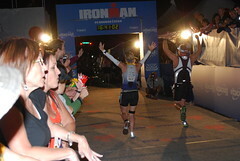 I have been enjoying the last couple days but connecting with my amazing Coeur Teammates and longtime triathlon friends. This sport has really given me some of the most amazing people in my life! Team dinner with the amazing Coeur ladies. 13 of us are racing! Trying to put my feet up whenever possible! Stuart and I picked up an early Christmas gift! We have had our eye on recover boots for a very long time. We picked up a pair of Rapid Reboots. Testing out my Coeur one-piece suit under my Roka wetsuit. All good! Stuart picked up some race day transportation! If you want to track me race day my number is 1761. I am shooting for 11 hours and hopefully top 10. The weather looks perfect. Time to burn down all the hay I have piled up in the barn!!! Totally going to be cheering for you! Go get it, girlie!! So excited to track you tomorrow! Leave EVERYTHING on the course!! I’ve got my phone loaded and ready to stalk you and so many others!! Have a BLAST tomorrow!! Lots of energy being sent your way! !